Outprosys Blog | Do what you do best, outsource the rest. Any further information that is relevant to the contract e.g. lookup tables, business rules etc. OutProsys designed and developed eCapture, an electronic capture alternative to paper based methods. 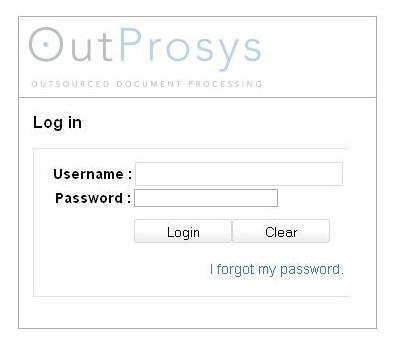 For more information on outsourcing with OutProsys view our Data Capture Blog. Running a successful business is all about monitoring your margins, keeping on top of outstanding debtors and creditors, and watching the bottom line. It seems simple, reduce expenses and increase sales; this will in theory increase profits. Unfortunately, as with everything in business, simple in theory isn’t always simple in practice. Running a successful, profitable business is complicated and requires dedication. It’s important to make sure you concentrate your energy on doing what you specialise in, in order to ensure your business succeeds and grows. The best way to do this is to cost-effectively outsource specific tasks. We understand business, and we know the hard work it takes to fine-tune a process. This is why our business model is designed solely to streamline your business. Our solutions reduce your administrative costs, save you time and thus, increase your profits. Outsourcing your document processing and data capturing is one important step you can take to streamline your business process. We’ve extended our dedication to helping you streamline your business by providing these 4 simple tips that all successful businesses practice. It’s not necessary to be in control of every aspect of your business anymore, allow someone else to help carry some of the burden. Outsource specific jobs to give yourself time to focus on building your business with the skills you have. You can’t expect yourself to master every business process. Too often a to-do list is actually just a wish list of tasks that you never get to the end of. The longer the list of administrative tasks the longer you’re kept away from doing what you do best, running your business. Shorten your to-do list, and streamline your business processes by outsourcing jobs that are best handled by professionals in their fields. Strong partnerships and good relationships with your suppliers and service providers will save you time and money. As part of streamlining your business process you need to choose suppliers who have a proven track record in their industry. Ensure that they’re open about their current and previous clients and ask for testimonials as a way of ensuring their quality of service delivery. Don’t try and build your brand alone, get to know what your customers think of your business and offerings. This will streamline your business process by ensuring you don’t waste time when building your marketing communication. A system as simple as customer comment cards or surveys can help you communicate with your customers about issues that concern them, this is efficient marketing. Results from these comments and surveys can be quickly organised and captured through intelligent data capturing. There are countless benefits to outsourcing your data capturing and document processing to a group of professionals. As professionals in this field we can guarantee accuracy and efficiency. We’ve spent years developing systems that ensure our data capturing process allows zero margin for error and maximises speed so that clients aren’t left waiting for important documents. Ensuring our clients are able to get accurate data, quickly, is central to the benefit our service provides, the benefit of a streamlined business process. So go have a look at our main website, browse our services and offerings, and then send us an email, and see how OutProsys can help your business. The Google owned reCaptcha system is something you’ll be all too familiar with, and something you will undoubtedly use every day online, even if you don’t have any idea what we are talking about. The reCaptcha system is one of many Captcha security options that web forums, blogs and forms use to protect themselves from spam robots. These systems work by providing an obscured series of words and numbers, which the user needs to identify and then enter in order to prove that they are in fact human and not spam robots. They are often just randomised letters and words, which serve no purpose other than preventing robots from filling out your forms and commenting on your blog. reCaptcha, however, has found an innovative new use for these programmes that has changed the face of data capturing and, in essence, turned every Internet user into a data capture technician. They have taken advantage of the millions of captchas that take place everyday to advance their book digitization process and ensure absolute accuracy with the data they capture. And all Internet users are now their data capture technicians, assisting with transcribing and deciphering text in millions of books, images and even on Google Maps. Their initial process uses OCR, which is the optical recognition of a hardcopy text document by a computer programme that then digitises the text and stores it on a server. This process relies on very little human interaction and uses absolutely no human power for the actual capturing and digitisation of text. This system, while very advanced, cannot deliver the level of accuracy that a double capture human driven system can. This is where reCaptcha is changing the face of optical recognition data capturing, and making the world’s Internet users a force for good. Internet users are literally helping the robots learn to read. In so doing they are not only helping to improve OCR technology and ensure accuracy of data that is captured, they’re actually improving the quality of digitized content on the Internet. So although it might seem to you that data capturing is something far removed from your own life, or even something that you don’t quite understand, it is in fact, not just something that is right under your nose but something that you help with and participate in everyday. The reCaptcha method is an extremely intelligent use of a system that was already being used everyday. What it really shows, though, is that OCR cannot compete with human captured data. To get truly accurate data capture results for business purposes, quickly and professionally, you need to rely on human based data capture methods. Our clients work on tight deadlines requiring accurate results while demanding accountability. They can’t afford working with the margin of error that OCR creates, nor do they have the time to wait for bugs and inaccuracies to be fixed. The OutProsys human based double capture method is the best as our manual data capture of handwritten text involves one operator first capturing the data and a second more experienced operator re-capturing each character blind. This ensures all data is double captured, complete and accurate; utilising a combination of our leading edge recognition technology (OCR), as well as highly trained and experienced data capture operators to capture typed and handwritten text in multiple currencies & languages from the scanned electronic document images. 1. Receive – incoming paper documents arrive at our production facility where they are sorted and prepared for transfer to high speed scanners. Electronic documents are securely uploaded directly to our servers. 2. Scan – documents are scanned at our production facility or via remote scanners at our clients. Electronic image files are securely uploaded directly to our servers. 3. Capture – converts the typed or handwritten text into accurate electronic information. In this process the data runs through double capture matching processes, predefined business rules and validation routines to ensure the data is complete, accurate and valid. While we tend to stick to posts related to Document Management and Data Capture, occasionally we come across a work-related resource worth sharing. This video, from the editor of a publication called “Early To Rise”, deals with a couple of points critical to improving your office productivity. We found it immensely valuable, hopefully you will too!